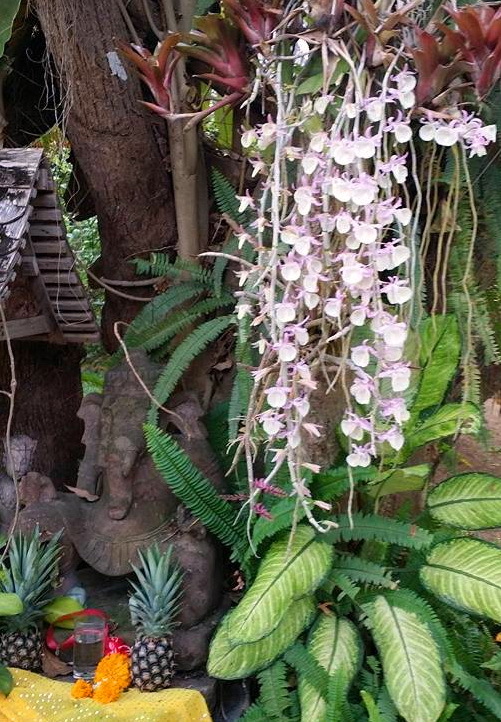 Baan Hom Samunphrai School, Herbal Health, Thai Traditional Massage, Herbal Steam Baths, Traditional Thai Massage Training Courses, Live-in Accommodations, Chiang Mai, Thailand, Conferences, Therapeutic Massage, Rasidaton. "The House of Sweet Smelling Herbs"
GENERAL INTRODUCTION. You can click on what interests you below. 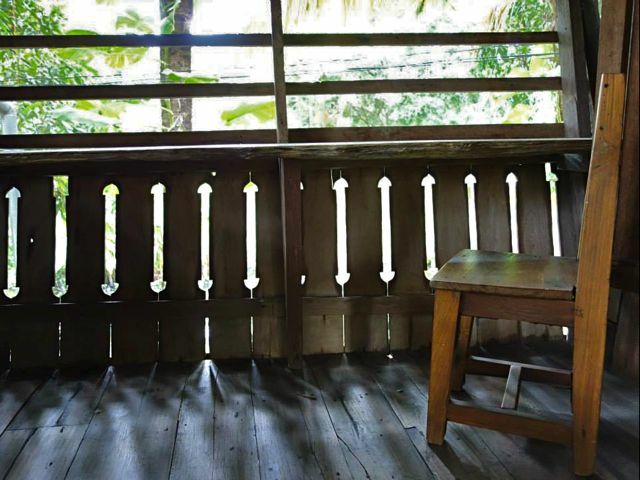 We're a Traditional Thai Massage School and Herbal Medicine Centre as well as a sort of Thai village inn with Live-in Accommodations for both students and guests. 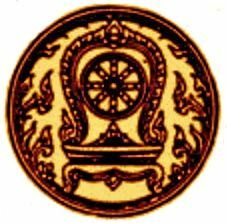 Licensed by the Thai Ministry of Education, we offer courses in Traditional Thai Massage, Womblifting and Related Herbal Therapies -- our classes are for 10 to 25 days with a maximum of 12 live-in students from novice to professional. But what's really unique about us as a school is that 25% of our visitors are guests or non-studying partners, some even with children. Indeed, everybody is equally welcome here, and anybody can sit around our big table or in a chair on the screened porch upstairs in one of our old wooden farmhouses. Our Director, the well-known teacher, Homprang Chaleekanha, is licensed as a Traditional Doctor, Herbal Pharmacologist, and Midwife by the Thai Ministry of Public Health, and our Certificates recognized by The Thai Ministry of Education. In addition, we host Groups, Conferences and Seminars (up to 20 participants) for those who want to come here with their own teachers and/or special interests. And this is also the home of the poet, Christopher Woodman, and we welcome writers, artists, musicians, actors, philosophers, circus performers and indeed anyone who is troubled by whatever you call that thing buzzing around in your bonnet. 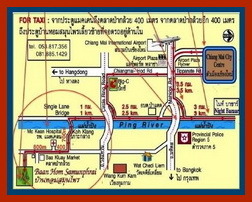 You can print out our Map in Thai and English to get here. It takes 15-20 minutes from the Chiang Mai city centre in a tuk tuk (3 wheeler), song taew (red pick-up truck taxi) or blue & yellow passenger-car taxi -- they all cost about the same. Our phone numbers are all there so when the driver gets lost he can phone us. There are more maps and information on our Where We Are page. Among other services, we offer Thai Traditional Massage and Herbal Steam Baths in a small village 9 kms southwest of Chiang Mai. But it's essential to phone ahead as we have only a few therapists -- 081.885.1429 goes straight to Homprang who makes all the bookings (we cannot book by e-mail as only Homprang knows who is available when). 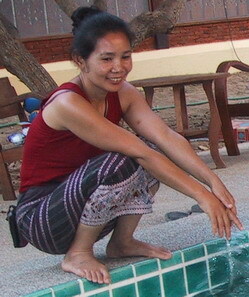 A Full Massage takes about two hours and costs 800 baht -- a Foot Massage is 400 baht and takes about one hour. Either can be combined with a Herbal Steam Bath (200 baht) which can take up to an hour and includes dips in our cooling pool along with home-grown herbal tea. If you think you might benefit from a special Therapeutic Massage (1300 baht), Therapeutic Massage with Herbal Compresses (1600 baht), or Womb-lifting (1600 baht), you can discuss your condition with Homprang. Indeed, you may come just for an informal talk about your condition with her -- there is no charge for that. And we welcome visitors. You will walk by this moss-covered waterpot under our Bo Tree as you enter. Beside students and their partners, our guests include individuals of all ages, couples and whole families who come to us for a variety of reasons: the beauty of the place, the good company around our big table, the herbal steam baths, massages and other therapies, and of course the opportunity to relax, catch up, recover, or get on with some personal project. There are no coffee shops, restaurants, bars or even 7/11s around us, so you can't just walk out our door for urban refreshment. On the other hand, we have rice fields, the river, small local temples and earth-markets everywhere, and very likely you will be the only foreigner wherever you go, on foot or by bicycle. It's rough, simple, and there's an awful lot of litter, but it's also somehow more than just there, and much more than beautiful. You can find out more about what it's like in "Where We Are." You can go to "Accommodations" for a description of our houses, and here for our Rates. Baan Uii Dee with its hand-made green tiles -- always cool and fresh under bare feet (no shoes are worn on any of our floors). You can see how the floor is used in the various photos of students preparing herbs for herbal compresses and steam baths in the subsequent pages. For more detail you can click on the Titles or go to our CALENDAR PAGE. A 60hr Wombliting Workshop in Mandarin with Eartha Su assisting Homprang. A 60hr Womblifting Workshop in Japanese with Kim Songshils assisting Homprang. CLICK HERE for a whole gallery of herbal workshop photos. Baan Hom Samunphrai is the home of Maw Samunphrai ("Herbal Medicine Doctor") Homprang Chaleekanha, 58, a specialist in Traditional Thai Massage (Nuad Boran) and Thai Yoga (Rasidaton) who also practices Thai Therapeutic Massage, Midwifery and Herbal Medicine. 'Maw Hom,' as she is called, grew up in a small village on the Burmese border with no road or electricity, the only 'doctor' being her rice-farming grandmother who doubled as the local mid­wife and herbalist -- there's more about her grandmother here. Maw Hom is now not only licensed by the Thai Ministry of Public Health as a Traditional Doctor but as a Herbal Pharmacologist, a Traditional Midwife, and a Massage Teacher, and her school is approved by the Thai Ministry of Education. 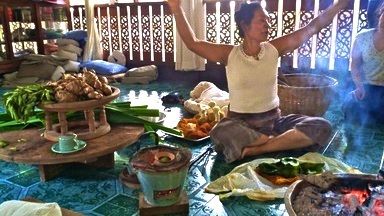 She has also travelled widely in Europe and North America, and is fluent in English as well as Thai, a rare facility among genuine traditional healers. 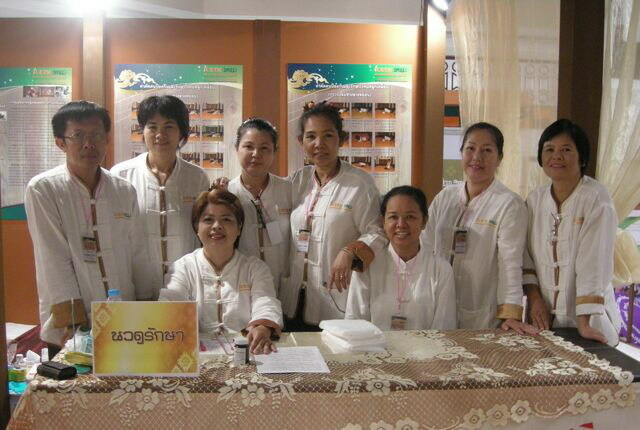 And finally, Homprang is very active in the local Thai community, and volunteers her time and expertise to Thai patients as well as to the growing number of Thai students coming back to their traditional medicine. And she's an inspiring leader. Maw Hom comparing notes with a Canadian Botanist; enjoying her friends by the pool; working with two professional colleagues, one Thai, one English; leading the Rasidaton (Thai Yoga) at 7am. 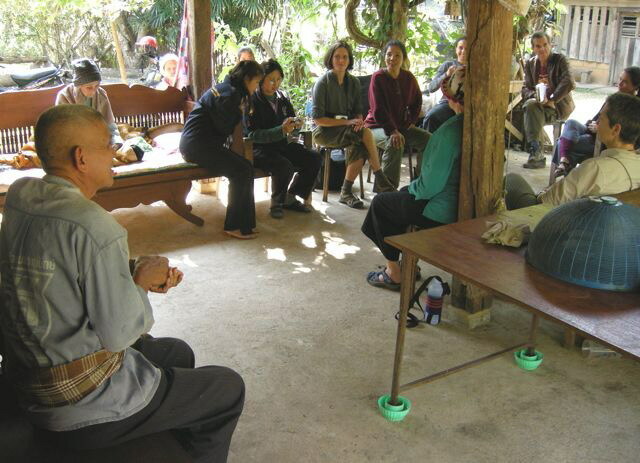 Introducing her western students to Acharn Suwan, a Buddhist philosopher & herbalist, at his simple garden retreat in Chiang Dao; demonstrating 'Womb-lifting' at an International Health Exhibition; with her colleagues at The Association of Thai Traditional Healers -- as a group they are heavily involved with teaching young Thai students old medicine! All the above roots, stems, leaves, flowers and fruit have medicinal value, and Maw Hom will show you them if not in her own herb garden then in her community or earth market. 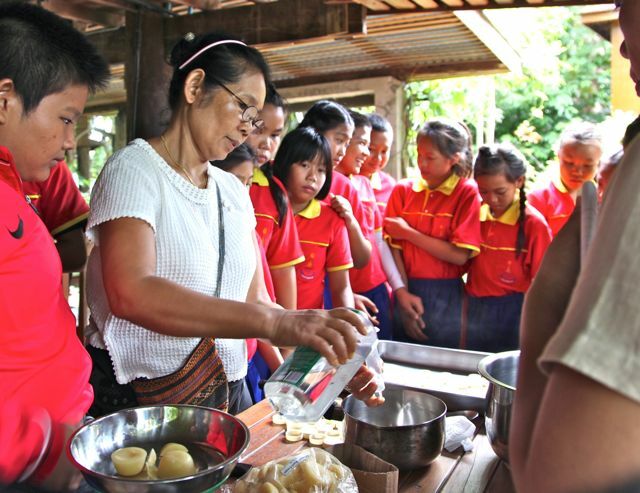 In the final photo, Maw Hom is showing Thai children from an International School how medicines were made when she was a child. The students all left with a little bottle of Tiger Balm made by themselves. This, she feels, is some of her most influential work. An appreciation of us by Brie Jacobs. "Thailand for me was such a beautiful, eye opening, majestic experience. I took over 4,000 photos in an effort to preserve the impressions as much as possible for when I got back home. Its something I want to relive over and over ." 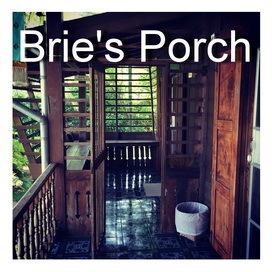 Click on Brie's Porch for an inspired visual diary. A glimpse through Bulgarian eyes. HOW HOMPRANG SEES HER STUDENTS & FLOWERS. Homprang frequently takes photos in class with her smart-phone and posts them on her Facebook Page. But she loves her garden as well, and often posts what she finds particularly striking as she moves among her flowers, medicinal plants, shrubs and trees just at daybreak. In actual fact she's attending to her numerous Spirit Houses at that hour, and a very substantial following of people from all over the world accompany her as she goes. This is the Ganesha shrine under the Bo Tree as you walk in along the wall. He has just been given a glass of clear water, a stalk of sugar cane, and two fresh pineapples, which he loves. You can click on the orchids to see Ganesha better.